In previous posts I detailed the extraordinary saga of 33-year-old Harry Bensley, who accepted a bet made between an American philanthropist and an English nobleman: to push a pram around the world, with his face encased inside an iron mask, for a purse of $100,000. Many sighting were recorded of "The Mask” at that time but then... he inexplicably vanished. TheBigRetort: where in the world did The Mask go? Almost one year after the wager made between Harry Bensley aka The Man in the Iron Mask, a publication known as “ Answers” (December 19th, 1908, pi63) received a response to this same question; it has remained buried until now. The respondent – who remained anonymous - had a very interesting tale to tell: hence the headline - "The Great Masked Man Hoax”. Popularised by a number of writers down the ages – the original Man in the Iron Mask (it was actually made out of 'black velvet') followed a narrative that was woven out of a factual account of a prisoner in France. Undergoing a fretful night in the confines of the prison, it was an iron mask that this supposed "anonymous" writer saw emerging from the shadows of a prison cell. It was all the inspiration Harry Bensley's fraudster and criminal needed. Harry wrote: "That night my thoughts kept reverting to the 'Man in the Iron Mask, ‘til, in idle fancy, I began to draw mental pictures of myself passing through life with an iron mask over my face." The hoax was born. Four years previous, Harry Bensley had been sentenced at the Old Bailey in London for a series of bogus claims and deceptions. Also known under the alias “Harry Barker”, the 29-year-old labourer had been collared in South Africa by Scotland Yard. He was convicted of bigamy under the name “Henry Burrell” and had a number of illicit aliases. It was Harry Bensley who became the man in the iron mask.... and the writer of the response to the “Answers” publication. His two callings being fraud and deception, Harry Bensley, due for release from his prison cell, began to evolve a scheme of 'considerable profit' – and a mask was its 'chief feature'. Harry spent the remaining prison term perfecting his plans. Writing the details 'over and over again' on a prison 'slate'; the terms of the wager; the conditions imposed; two wealthy philanthropists - one of whom he had never actually met, the American banker John Pierpont Morgan, and the other a not totally fabricated English 'nobleman' - were prison cell 'creations'. Released in November 1907, with a gratuity of 30 shillings - his 'sole worldly possession' - Harry set about commencing his fraud on the nation. It was a fraud that would last a century. Until he was unmasked here that is. Harry purchased a large map of the British Isles 'and other trifles'. At Clarkson's, a well-known costumiers. Harry inspected several masks of various origins. The one he wanted, a knight's helmet, was priced at more than he could afford and so he left it 'for the time'. Just hours out of prison, taking the train out to the country where his 'wife' was living, he made known the terms of the 'wager'. Gossip 'soon bruited'. One neighbour agreed to provide the perambulator - 'for a future consideration' - and so became an unwitting accomplice in the century-long deception. Harry did not name the 'nobleman' who assisted in creating the hoax. He was apparently, "German - a man of superior education, and evidently of some social standing," and they had done time together. It was to this ex con that Harry confided the truth. "To my surprise he offered to finance me, adding also his willingness to help me in any other way besides." Unfortunately the German wanted a 'backhander' from time to time. 'A heavy tax on my takings' Harry later wrote. Nevertheless, Harry finally went home with the twenty-five-shilling iron mask and a moderate supply of pamphlets and postcards advertising 'the wager'. The mask and pram were also inscribed with the details. Harry was pictured standing boldly wearing the iron mask with the pram and his young aide alongside. The latter an additional expense for which Harry had a ruse, a dodge ‘as ancient as Adam'. By way of security Harry Bensley set about deceiving gullible young men who would assist in the Wager. These unsuspecting 'teenagers' - for a £5 fee - were offered a third of the eventual prize money: if they completed the terms of the Wager. Since Harry never intended completing such a trek, there would be no obligation to pay. On the other hand if this boy left Harry's service within six months of engagement, he would forfeit the fiver. A win-win for Harry. Old Iron Mask also had to get married 'on the road somewhere' – without removing the mask. This did not stop Harry. "I already had a wife," he admitted. Harry had in fact been married in 1898. A bigamous marriage folowed that would see him sent to prison. It was this 'new wife' that done for Harry and it was she who secretly joined him at safe houses along the route of the wager. It was the morning of the Wager. In London it was 'very foggy'. Harry had driven to the station in a taxi with his 'minder'. They had boarded the Charing Cross train without any attention. However, it was the decorated perambulator that attracted an 'eagle-eyed' stationmaster who asked the man in the iron mask if he had a ticket for it. Finally, it was only when the 'Mask' was halfway across the platform that Harry found himself in the midst of an excited mob. "For a moment I felt horribly nervous.” However, instead of making a dash aboard his connecting train, Harry started selling his newly-minted postcards: "for all I was worth.” (The postcards listing the fictitious wager can still be found in second-hand shops or on Ebay.) Newspapers later reported that at approximately 10am a train which was carrying a man wearing an iron mask pulled into Charing Cross Station. A representative from the Daily Mirror photographed the man in the iron mask and his young minder. The walk 'through the world' had commenced. Flanked by enormous cheering crowds - Londoners literally threw money at masked Harry. Down the Strand, on to Cheapside, over London Bridge, on towards Woolwich... by the time they stopped it was 9.30pm. Exhausted, they had not eaten since breakfast. They were very hungry. Later, the Man in the Iron Mask, an ex-con, made an untimely appearance at Dartford Court. He stood charged with peddling postcards without a license. But when his lawyer explained the conditions of the bet - following hearty deliberations - the chairman of the court allowed the defendant, who then offered the alias “Henry Mason”, to remain masked. This was a first in British criminal law. Had the chairman ordered its removal the legend of the masked wager would have died at Dartford. Instead - “We are not anxious to know the (his real) name,” said the court chairman. 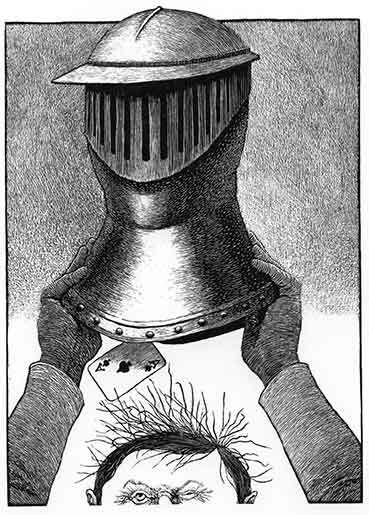 It had been ten long months since Harry Bensley commenced the iron mask deception. And yet, he had still not left English shores. Of course people were starting to ask questions as they could not remain gullible for so long, could they? In turth, if ever there was one for a man like Bensley, Harry was tired of being welcomed by lord mayors and a gullible admiring public. A pram full of postcards. A punishing daily routine. A heavy metal helmet. The fabricated wager had now become Harry's Pentonville. The deception was closing like a metal vice around Harrys head - literally. Mobbed by crowds. In the sometimes excessive heat or cold of England. Having to sit through boring speech after boring speech by whatever dignitary was throwing dinner. Harrycould not eat or drink himself due to the helmet. The fictitious wager, sown out of a prison cell, had turned into a heavy burden for its creator and the iron mask had become the cross that Harry the deceiver bore for this his greatest swindle. Finally, after covering a distance of what he claimed was some 2,400 miles, the prisoner in the iron mask threw 'up' the sponge. "My eyes ached, and I suffered with racking pains in my head," Harry opined. It was at Wolverhampton that Iron Mask was finally no more and disappears from newspaper accounts about this time. Weeks later, Harry wrote in to the publication "Answers” (remaining anonymous of course): "In conclusion, I can assert without fear of contradiction that I have paid my way, and supported myself, my wife, and my assistant, and the horses and attendants I employed, entirely from the sale of my cards and pamphlets, and I have received nothing in the shape of charity from the first day of my itinerary." Nothing but deception.... Harry Bensley never did make it around the world. He had never intended to leave these shores; not really. Neither was he ever arrested for this his greatest deception. Could this be why the Great Masked Man Hoax remains unknown - even today? Or is there something else at play in the human psyche that causes fraudsters like Harry to seize upon it? Perhaps myths and legends are best left unchallenged. Harry Bensley died in 1956. His postcards still bear witness to the faded memory of a con in rust-covered iron. And it is on this which the legend of the Mask sits.